Meteora Monasteries in Greece and the sites of ancient Troy and Ephesus in Turkey. Marmara, the Carpathian Mountains of Transylvania and the Austria’s back country. lochs in Scotland, Loch Lomond and Loch Ness. Norway’s most famous passroad - "Trollstigen"
Medieval evening: dine like the knights 700 years ago! of heavy combat in WWI. around the oldest known natural human mummy (more than 5,000 years old). 1956 Winter Olympics were held. Take a ride to legendary Venice, which is less than 3 hours from our base hotel. of history, located on the Costa del Sol (Coast of the Sun). The historic Andalusian city of Ronda, cradle of Spanish bullfight. Granada’s famous Alhambra and the Albaycín (old city center). The Alpujarras (“Sierra of Pastures”) – a paradise for motorcyclists. El Torcal, a spectacular limestone formation. There is no way to travel by motorcycle in Europe without being awestruck. No other place in the world is quite like it. Touring by motorcycle permits you to experience the sights, sounds, smells, and other sensations in a most seductive way. It’s as though Europe was designed to provide motorcyclists with an incredible playground. Although The Old World has an extraordinary past, the continent leads the world in fashion, art, music, architecture and design. Motorcyclists will have the opportunity to enjoy all of this, but in addition they will enjoy the breathtaking landscapes and stunning scenery. Europe is synonymous with diversity. Europe today consists of 47 independent countries ranging in size from Russia, with some 140 million people, to Liechtenstein with a population of only 35,000. Many European countries consist of multiple regions and cultures. Diversity extends to the multitude of languages spoken in Europe. Most countries have their own language and many have several languages. There are also dialects, and some smaller languages that don’t make the list of official languages. In many countries, young people speak English, but you’ll often meet people who don’t speak or understand English at all. In Europe, the landscape in places just a couple of kilometers apart can be completely different, and cultural history manifests itself everywhere. From the fjords of Norway to the Swiss Alps to the Pyrenees that divide Spain and France, to the Moorish palaces of Andalucía, to the ancient ruins in Greece and Turkey, it just never stops. Many riders, especially upon touring Europe for the first time, speak of “sensory overload” and literally must stop to permit a particularly stunning experience to set in. 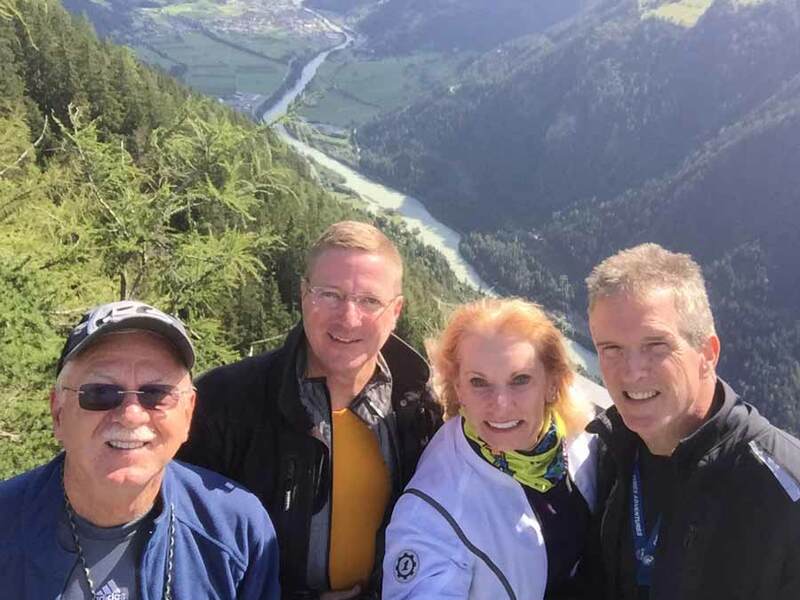 Our native European tour leaders have carefully assembled a portfolio of motorcycle tours that range from an 8-day Indian Summer in the Alps Adventure to our 34-day, 14-country Munich and Istanbul motorcycle odyssey. More than any place in the world, Europe is the venue where our policy against limited choice “set menus” and budget-priced “tourist hotels” is most appreciated. Be prepared for our European Adventures to exceed your highest expectations. Review the testimonials on our website and you’ll begin to get an appreciation for the excitement you’ll experience on your European motorcycling adventure with us. September 7 – 21	 Berlin to Budapest 15 $9,500	 $8,000	 NEW! October 5 - 18 Georgia and Armenia 14 $8,950 $7,500	 NEW! Ayres Adventure Switchback Challenge was amazing. If you are the type of rider who measures the chicken strip before and after your ride (like my husband does) then this tour is for you. We spent most of the time leaning than we did riding up right. This was especially challenging for me because I was riding two up and in charge of the filming while trying to hold on. Axel was not only entertaining but a wealth of knowledge when it came to the bikes, riding and safety. He made sure to include me in the decision making process even though I was the only female and pillion. He went above and beyond to make me feel like a real life princess on my birthday. The little touches did not go unnoticed. Thank you Axel and thank you Ayres for the trip of a life time. Erica created a video about our 2016 Switchback Challenge Adventure. Click here to watch the video.